During my time in the Netherlands, attending concerts became a habit. I’d go alone, for I did not want to be responsible for other people’s enjoyment. I’d arrive just before the doors closed. Occasionally I would bring others, such as introducing modern music to colleagues and neighbors. It was not unusual to go to concerts every day or several times a day. You could say I was a concert junkie. Here on Maui where classical concerts are few and far between, a rare treat, I daresay, I attend for other reasons. Recently I brought thirteen of my students and their guests, altogether 20 of us, to hear Dan Tepfer perform the entire Goldberg Variations from memory plus his own 30 variations as jazz improvisations. Here was a unique opportunity to hear a modern interpretation of an old work. For some, it was their first time going to a part of Maui (upcountry at night) they normally never have the opportunity or excuse to travel to. For others, it was their first time attending a solo piano concert. 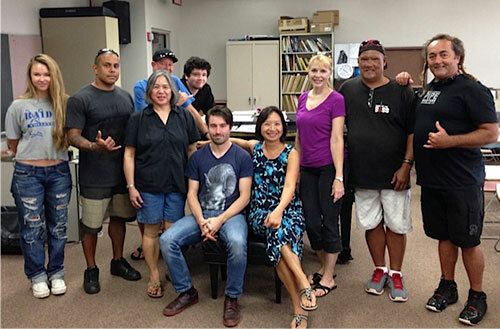 I had invited Dan Tepfer to visit my piano class earlier in the week. After his talk and performance, he coordinated and improvised on our group piano playing. For most, it was their first time having a conversation with and making music with a professional musician on tour. I actively encouraged my students to attend his solo concert and made it more possible by collecting cash in advance and arranged with his impressario for ticket reservations. I needed to make sure my students and their guests were committed in attending this concert at a place they’d normally not travel to. There was comfort and certainty in going with a group of people, i.e. to be with the familiar, which was also a determining factor (peer pressure) for some. Thinking back, the first concert I had ever attended was one of Schubert in Okinawa. My father had taken me there. I remember dressing up and looking forward to attending this piano recital. It was an event. Perhaps it does take someone to “introduce” or “encourage” you to take the first step — as a date or in a group — to your first concert. Hello Anne, never before had heard anything from and of Dan Tepfer – really great musican. Take care, Gerard. We would love to play your Happy Hour Sandwich next week when RB arrives and share your music with the audiences here. Please email as most of our duo music is stored away in the Netherlands.